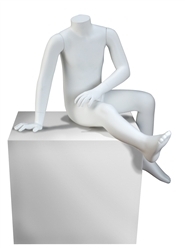 8 year old unisex headless child mannequin in white finish. Made of unbreakable plastic. Perfect for your child displays. Arms and leg is removable for easy dressing. Base included.